We're participating in Older Americans Month to raise awareness about the 1 in 12 seniors in our country who are food insecure. Here are some ways you can help spread the word! 1. Create an #endseniorhunger sign and pose for a photo with a senior you know. Post the picture on any social media platform and ask others to do the same. 2. 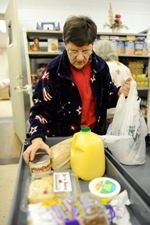 Host a Solve Senior Hunger food drive and collect food items specifically needed by seniors citizens. 3. Contact congress and encourage them to support senior feeding programs such as The Senior Farmers’ Market Nutrition Program. Sponsor a Walk team or form one of your own! The New Haven and Norwich Walks take place on Sunday, May 17. Watch the fun had by all in Bridgeport on April 26! Red Nose Day is a campaign dedicated to raising funds for children and young people living in poverty by simply having fun and making people laugh. Tune into NBC on Thursday, May 21st for the three hour TV special filled with America's favorite comedians and muscians. Looking for volunteer hours or interested in getting a group together to help our neighbors in need? Click here to learn about the volunteer opportunites Connecticut Food Bank has to offer at our three warehouse locations. 1. Collect and bag non-perishable food items. 2. Place the bag of food at your mailbox for a letter carrier to deliver to Connecticut Food Bank or local pantry. Shop for a good cause at the vineyard vines Westport store on May 21st from 4 p.m.- 6 p.m. When you do, vineyards vines will take 10% off your purchase and will donate the proceeds to Connecticut Food Bank.